Get more with Orbitz Rewards, right up to your check-in date! Book your hotel today, and if you find the same hotel for a cheaper price elsewhere online, we'll refund the difference up until midnight before check-in. 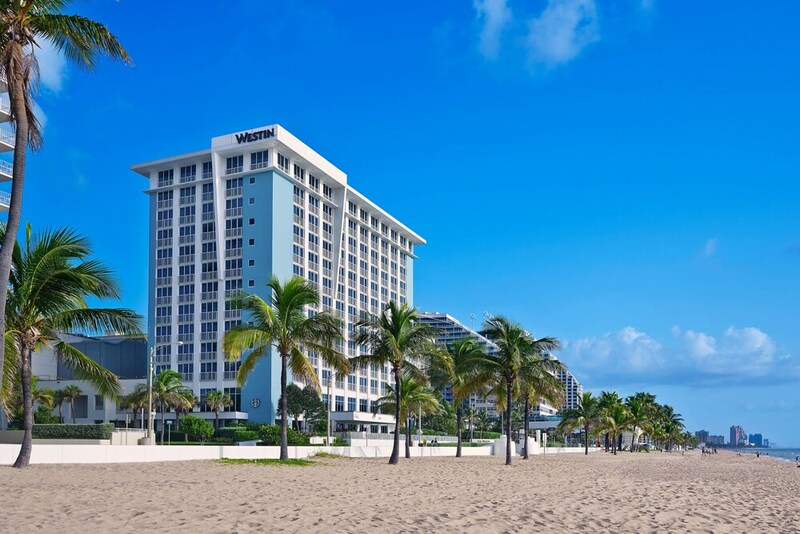 Located in East Fort Lauderdale, The Westin Fort Lauderdale Beach Resort is adjacent to Fort Lauderdale Beach and within a 10-minute walk of other popular attractions like Las Olas Beach. This 4-star resort has 432 guestrooms and offers conveniences like 2 restaurants, a full-service spa, and an outdoor pool. Enjoy dining at the resort's 2 onsite restaurants: Lona specializes in Mexican cuisine, and serves lunch; dinner, or Tinta offers relaxing ocean views. Savor a meal from the comfort of your room with 24-hour room service, or get a quick energy boost at the coffee shop/café. Buffet breakfast is offered for a fee each morning from 7 AM to 11 AM. A TV comes with cable channels and pay movies, and guests can stay connected with free WiFi and wired Internet. Pillowtop beds sport premium bedding and the bathroom offers a hair dryer. Other standard amenities include a refrigerator, a coffee maker, and free newspapers. Guests of The Westin Fort Lauderdale Beach Resort enjoy a full-service spa, an outdoor pool, and a 24-hour health club. Parking is available for USD 40 per day (USD 40 per day for valet parking), and there's also limo/town car service. Multilingual staff at the 24-hour front desk can assist with dry cleaning/laundry, securing valuables, and luggage storage. Other amenities at this beach resort include free WiFi in public areas, conference space, and a business center. Popular with families, business travelers, and cruise-ship passengers from nearby Port Everglades for its surrounding shopping, restaurants, nightlife, this luxurious Westin hotel provides a relaxed ambiance exemplified by the overstuffed seating under ceiling fans in the air-conditioned lobby. A 75-by-35-foot pool and expansive sunning area with ocean views is on the palm-fringed, second-story deck in the North Tower. From there, a skybridge spans the main street that runs parallel to the ocean, with an elevator providing access to the 11-mile-long (17.7-km-long) beach. On the South Tower's ground floor, a secluded, 50-by-25-foot garden pool offers peaceful sunbathing. Guests can also use free bicycles that are provided onsite. Event facilities include 32,000 square feet (2,973 square meters) of indoor and outdoor of flexible meeting space.S Spa services and 24-hour health club are available on site. Concierge services and currency exchange can be provided. A mandatory resort fee includes discounts to the spa. The Westin Fort Lauderdale Beach Resort is a smoke-free property. The Westin Fort Lauderdale Beach Resort offers 432 air-conditioned accommodations with safes and complimentary newspapers. Pillowtop beds feature premium bedding. Televisions come with premium cable channels and pay movies. Guests can make use of the in-room refrigerators and coffee/tea makers. Bathrooms include shower/tub combinations and hair dryers. Guests can surf the web using the complimentary wired and wireless Internet access. Business-friendly amenities include desks and phones. Additionally, rooms include complimentary bottled water and irons/ironing boards. Housekeeping is provided daily. Lona - Oceanfront dining featuring soulful Mexican cuisine. Waves Pool Bar and Grill - Light fare and cocktails. Starbucks - Variety of coffee drinks, espresso, and pastries. Start your morning with a buffet breakfast, available each day from 7 AM to 11 AM for a surcharge. You can order up room service around the clock. Recreational amenities at the resort include an oceanfront outdoor pool and a fitness facility. Heavenly Spa by Westin offers an extensive menu of revitalizing spa treatments as well as skincare and salon services. Rollaway/extra beds are available for USD 30 per night. Reservations are required for massage services and spa treatments. Reservations can be made by contacting the resort prior to arrival, using the contact information on the booking confirmation. The property has connecting/adjoining rooms, which are subject to availability and can be requested by contacting the property using the number on the booking confirmation. Guests can arrange to bring pets by contacting the property directly, using the contact information on the booking confirmation. ©2019 Orbitz, LLC. All rights reserved. Orbitz, Orbitz.com, and the Orbitz logo are either registered trademarks or trademarks of Orbitz, LLC in the U.S. and/or other countries. Other logos or product and company names mentioned herein may be the property of their respective owners.